There is a whisper of water that gently mists my face, speckling my glasses as I make my way towards the quiet roar a few feet away. 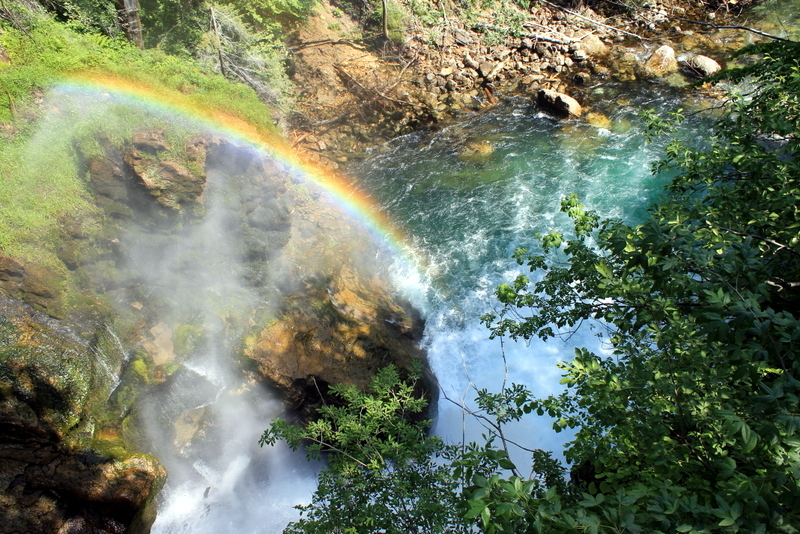 I breathe in the fresh Slovenian air, and let the sheer beauty of the clear Radovna River cascading down, down, down into a rainbow, against a blue morning sky cement my first activity of the day: exploring the Julian Alp’s Vintgar Gorge. 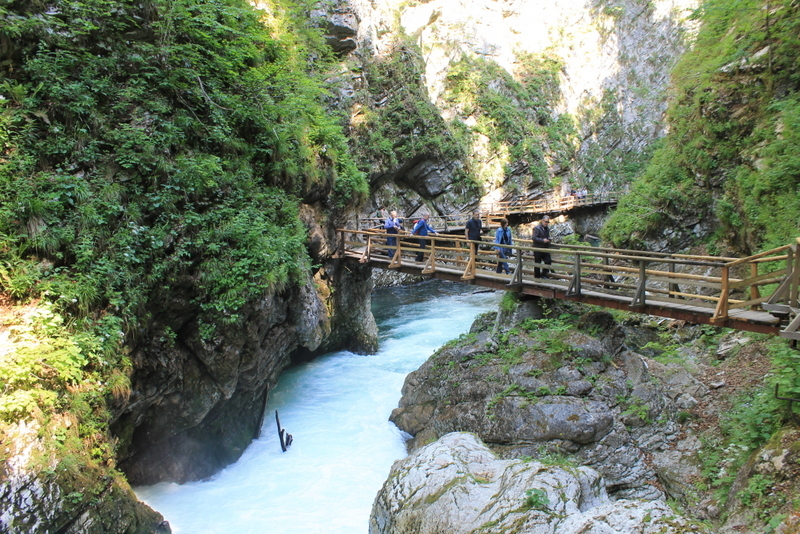 Only a little under 2 km, the trek into Vintgar Gorge (also known as Bled Gorge), and a quick drive from the enchanting Lake Bled, is accessible for all physical levels. 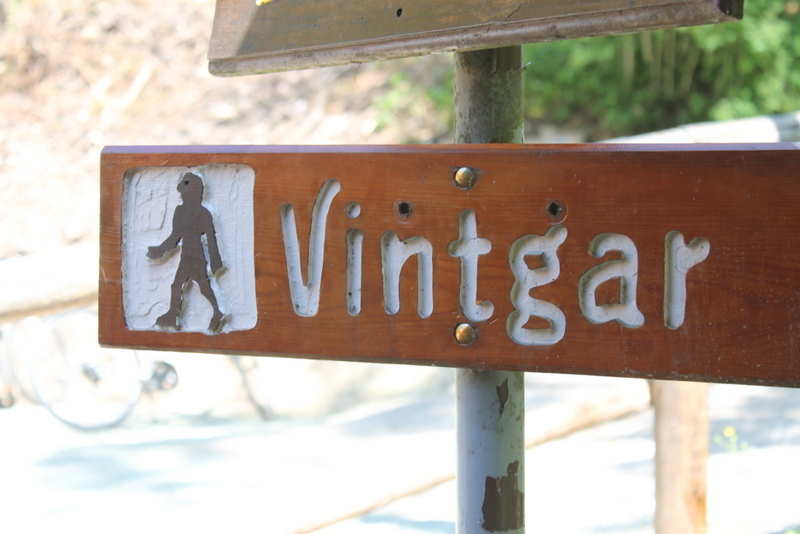 It beings modestly, the lazy river nearly silently moving alongside a crunchy dirt path as tourists mouth “wow” to each other as they begin the hike into the gorge. Even though I’m with the Alpine Fairytale Roundabout tour, I opt to walk into the gorge solo, marveling at the gorgeous, simple display of nature all around me. The beginning of the walk tells the story of the winter. A cruel winter as far as the story goes for Slovenians. An ice storm that hit in February snapped trees like twigs, their carcases laying scattered alongside the path and littering the steep inclines that lead to the gorge. The damage, which required a rebuild of sorts to the paths here, rendered the gorge’s opening this season a bit delayed. In fact, its mid-May, and it has only just opened a few weeks ago, missing out on entrance fees from earlier in the shoulder season. I follow the meandering path that leads me alongside the water, which alternates between angry, rushing white to crystal clear blue that lets me see skeletons of trees past laying soundly at the bottom. Lush trees that survived the ice stand tall, their tufts of green gently moving in the sweet morning breeze, as I make my way from dirt to wooden planks, encased by walls of rock that the river shears through. There are times along the path where I cannot see anyone around, and I relish those moments. Those quiet spells where it is just me and nature, and I am grateful. For the moment. For the magnificence of my surroundings. The visitors come and go, mostly walking past me, back to the parking lot where tour buses and cars with license plates from all over the EU await. Finally, I come to the portion of the trail which takes my breath away — wooden planks affixed to the boulders and cliffs and jutting out over the water below. I wind between rocks, looking down at the blue-green-white below me as I move closer to the final destination: the 26 meter Šum water fall. I can hear it before I see it, a soft roar that is unmistakably the sound of water pouring over a ledge. 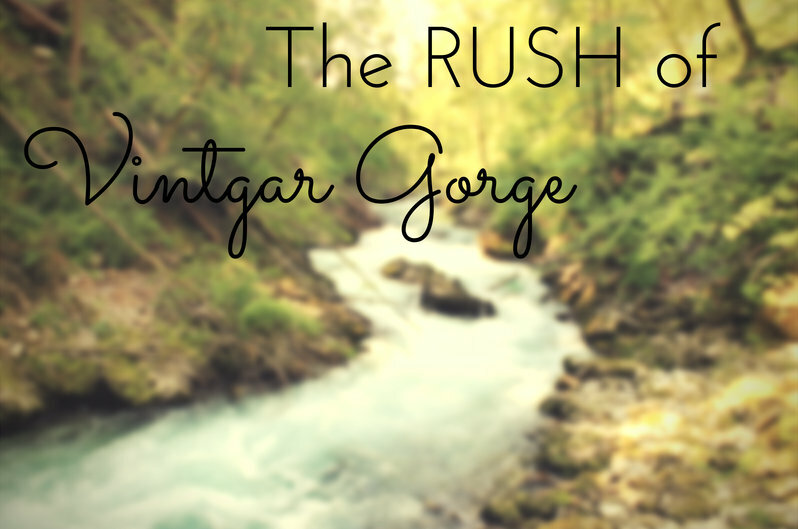 I hit a smaller fall first, water spraying at me, and tiny puddles at my feet, then I make it down steps to the crowning glory of Vintgar Gorge: the massive waterfall. Below the stairs, people linger sipping small cups of coffee and eating ice cream, despite it being only 10 a.m. A tiny snack shack greets visitors who line up 10 deep to enjoy their own cold snack. 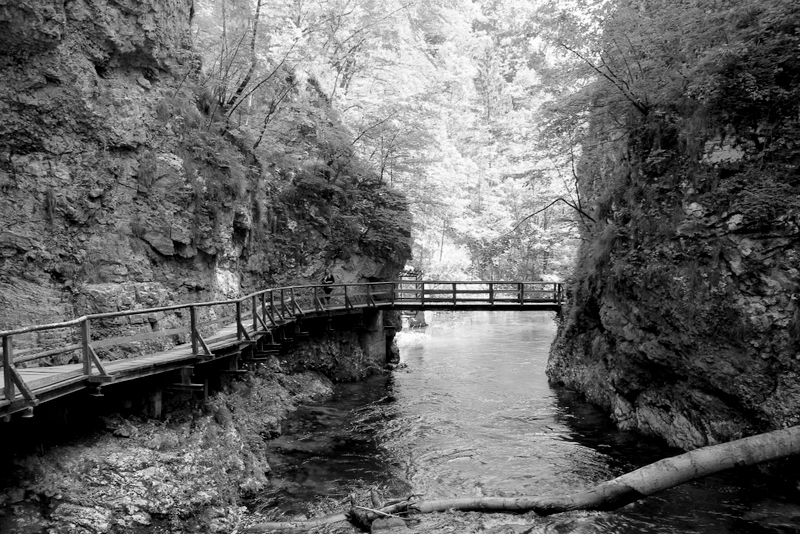 I lean over the rail of the fall and look down to the bubbling water below where, after that initial drop, the water quiets and continues on through the countryside, no longer surrounded by the cool and shade of the gorge, but out into the open. My little group decides we haven’t seen enough, and while it looks as if the path stops here, we notice a set of stairs leading down behind the snack shop, and follow them. At the bottom, we cross over the water and are treated to a glimpse of the falls from a different perspective: looking up. And while I much prefer the colors and atmosphere of the gorge, this view isn’t shabby in the least. After reveling in the view for a few, we all begin our walk back to the entrance. 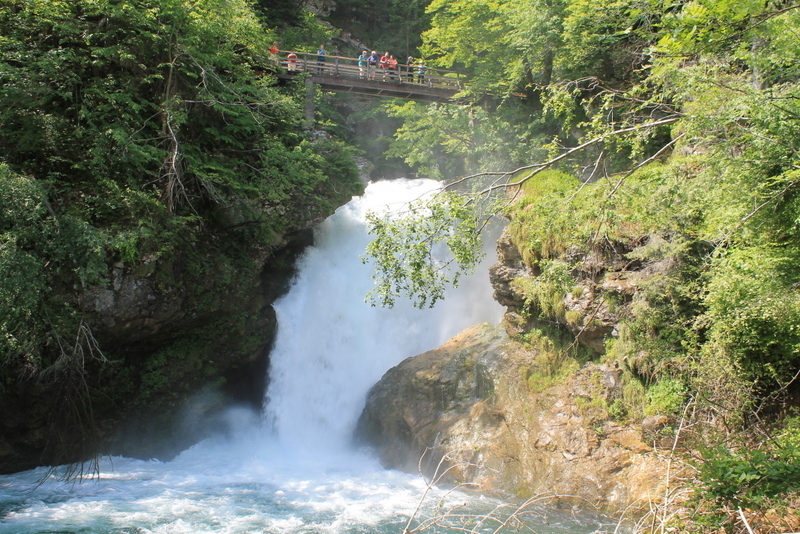 I take my time returning, letting this cool whisper of nature embrace me for a few moments longer before I leave the embrace of the gorge and head back out into the morning and on to Lake Bled and Lake Bohinj. Beautiful imagery, D! The pictures are absolutely stunning, too. You write so we’ll; I may have to start subcontracting you! Miss you and can’t wait to see you this fall! 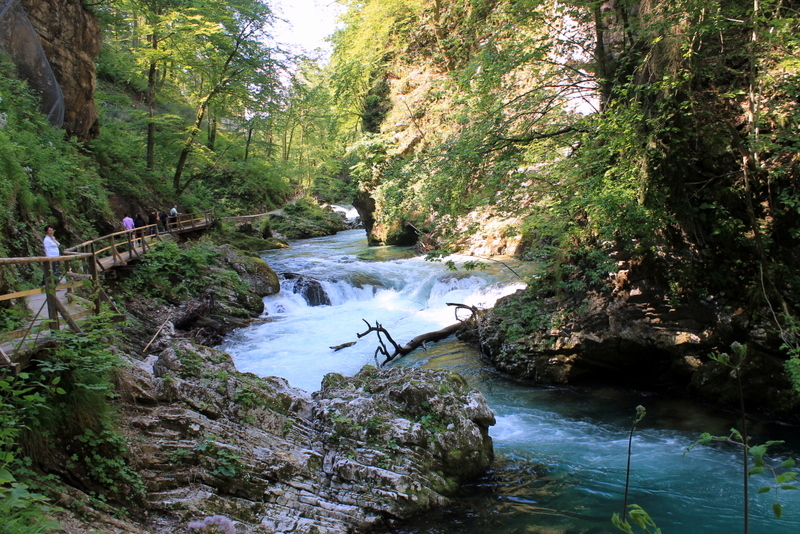 I love these walks, the sound of the water, the cool breeze, the green trees…hopefully will be doing one soon! I hope so! It is so healing and invigorating to have a good wander through such beautiful spots! Oh my god Diana, that place looks beautiful! That is a hike we would very much enjoy. Looking forward to getting over to eastern Europe. It was SO magnificent. Definitely go there. Eastern Europe in general is quite stunning, actually! So gorgeous! 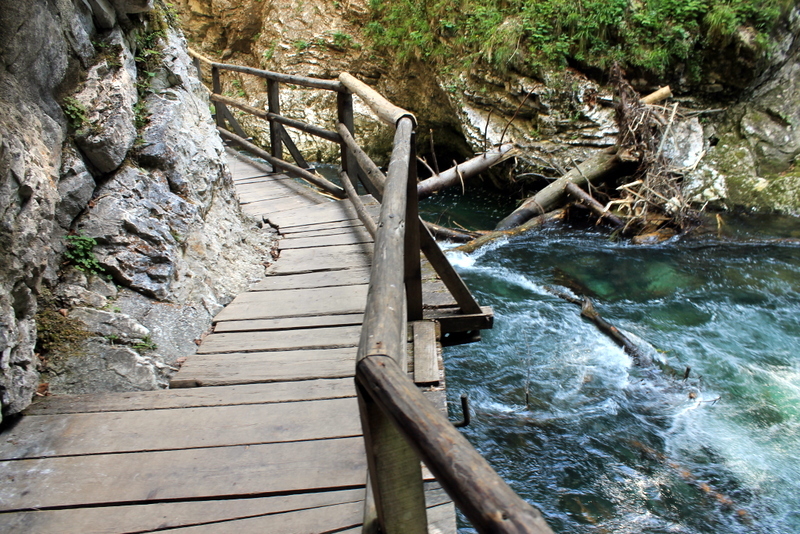 I’m still bummed I didn’t get to see more of Slovenia on my brief day stop this summer. So glad you had the chance to make it here, so many just hit Bled and Ljubljana and nothing else in Slovenia. There’s so much more to this country. I want to go back and spend a month just driving around and exploring. It is such a magnificent country! Gorgeous photos and beautiful storytelling, as usual. You are bringing a part of Europe I never knew much about to life for me! Thank you!! Slovenia is a gem. 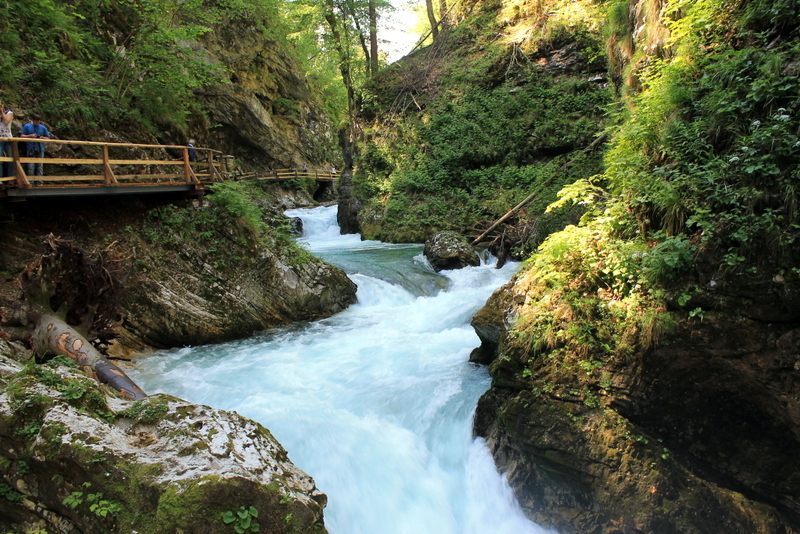 Hi Diana, Your fan from India..I must say Slovenia absolutely looks magical & a fairy tale land! !, Eastern Europe is awesome with so much history & beautiful places!!. Your blog is great (and you have been posting some of the best pictures i have ever seen).. Thank You!! & Looking forward to see much more!! Hi Prajwal, thank you so much! 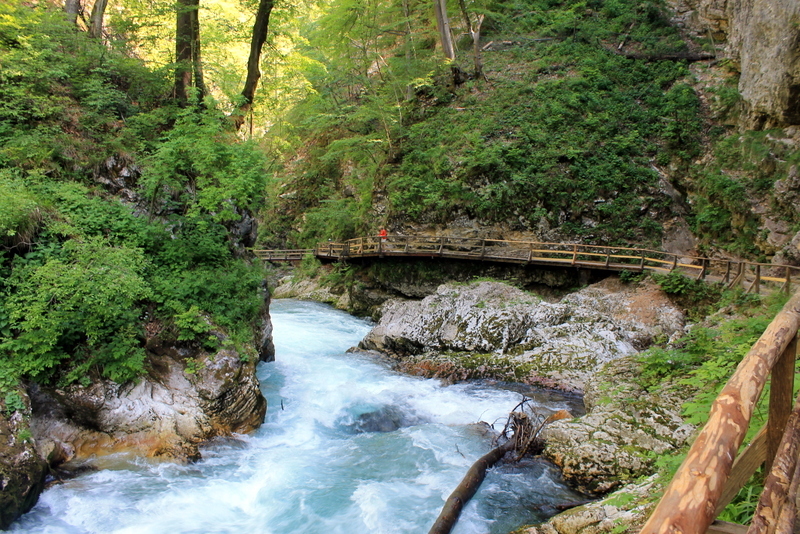 Slovenia is beautiful and I am glad you are learning about the country! I appreciate the kind words. Thank you for the support! Hi Diana, Thanks for the reply, I absolutely love your blog (you have been writing out of your heart, it shows you love traveling as much i do) & for me this is kind of the blog is which i would be eager to follow & read through. I am proud to say your blog is one of my favorite places on the Internet (i keep checking my inbox frequently to see what’s new to read & see). My fascination to History, Culture & Traveling started from accidentally visiting the website of Rick Steves (He is an American Dude who does lot of travel writing, travel documentaries, writing guide books etc which covers Europe through his company). The way he puts the travelogue is more interesting to see & hear (He is on my favorite list too!!). My weekends are spent on Rick Steves YouTube channel seeing his travel videos (seeing them is like Virtually Touring Europe!!). Thanks Again for this awesome blog, As always looking forward to see more!! Always fan of you & your blog. Aw, thank you so much Prajwal! It means so much to me that you take the time to read my blog and comment. I am glad you enjoy my writing and stories! I do know Rick Steves’ work! Drop me a note anytime! Hi Diana, Thanks for the reply. BTW photos of Venice looks fantastic. I felt this happy enthusiasm of meeting a blogger who loves traveling & even more eager to share it with others. You are an inspiration to me & all others (its not only about traveling), its about the dream that you follow, which we all adore. Will keep in touch with you & your awesome blog. (You can expect to see my long replies, Hope it doesn’t bore you!!). “Go Girl- We are with you”!! 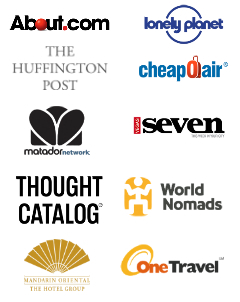 Keep Exploring the Beautiful World (and introduce them to us with your blog posts).